My norm is my favorite stainless steel water bottle from Mary Janes Farm filled with water and a squirt of lemon juice or a drop of lemon essential oil. But some days I like to dress it up a little. I will pick whatever herbs sound good at the moment and add them to a jar and fill with water. I almost always choose from the lemony herbs- verbena, lemon balm, lemon thyme, and add mint or tulsi. Sliced fruit is great, too. Letting it sit on the windowsill or the garden table for a few hours infuses the water with a refreshing herbal flavor. I love anything lemon, and this strawberry lemonade sounds delicious. 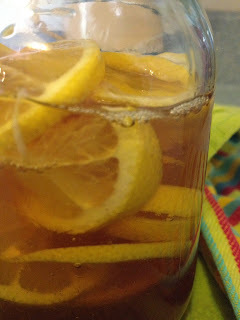 Of course, I would add a sprig of lemon balm or lemon verbena to boost the lemon flavor. And this Herbal Lemonade Station sounds like a lot of fun for a summer gathering. 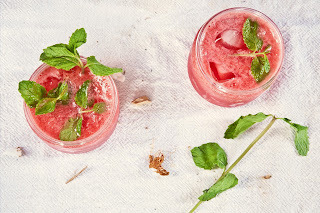 What is your favorite herbal summertime drink? Please share a recipe or a link if you have one!